VDE - SANG MAO ENTERPRISE CO., LTD.
For cables, insulated cords, installation conduits and ducts, the VDE Cable Mark is applicable. 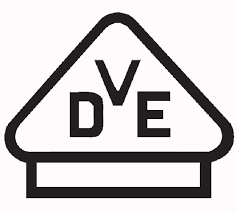 The VDE HARmonization Marking or VDE HARmonization Thread resp. for cables and insulated cords according to harmonized certification procedures.Testing is based on the Harmonization Documents (HD) listed in the HAR Agreement. Products (harmonized power cables) tested and found in compliance with with the requirements of the mentioned standards may be marked with the VDE HARmonization Marking. Further information is available from the Laboratory for Cables and Cords, Materials and Special Tests.